The Department of Education does not lay down a policy on homework and it is up to schools to set their own agenda. According to INTO, each school sets its policy in line with guidance from the Department of Education. In its guide, the department tells parents that if their child gets homework, they should give them the space and encouragement to do it. "If f they need it, offer your help. Take time to talk with your child about what they do in school each day," the guide states. It also advises parents whose child is having ongoing problems with homework to discuss this with the teacher. According to ASTI's education and research officer, Moira Leydon, different schools have different policies with regard to homework. She says: "Increasingly, schools have a whole-school approach to ensure consistency and an appropriate balance of work for students. However, all recognise that homework has a role in consolidating work done in schools, in allowing pupils to work on their own initiative and in fostering self-reliance." "Homework correction allows a teacher to encourage self-directed learning. The most important aspect of homework is establishing a satisfactory routine. Students will be happier going to school if they know their homework is completed. There are no hard and fast rules for the amount of time pupils should spend on homework. A broad guideline for first-year students would be an hour and a half, but this will vary from day to day." "There is international evidence that consistent setting and marking of homework by teachers is associated with higher levels of student achievement. 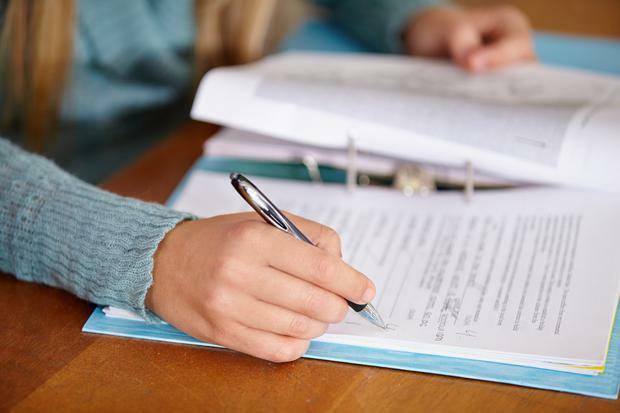 It's important to note schools regularly review their policy on homework as part of their cyclical school self-evaluation process."